These are 3 of my grandchildren. And it’s rare to see them all getting along at the same time! So when we were almost done setting up the tree, I had to capture these precious moments to keep and now share. Khali is the little one on the left. She just turned 2 in October. She came to live with me in May of 2012. Brooklyn just turned 10 in October and that’s her brother Caleb she’s holding on to (hoping he won’t drop her), he turns 9 in January. Those two have lived with me since 2008. As I’m typing this I realize I have a pretty big smile on my face and tears are starting to form in my eyes. Most days with the kids aren’t always presenting a smile. For those of you that have kids old enough to bicker and battle with each other you know what I’m talking about. And when those days happen, or should I say when those moments happen, it can be tough. These kids go to school and play with friends that have a mom and most likely a dad that take care of them. And my two have a grandma they call Nana that they live with. They’ve been through struggles most of us as adults can’t even imagine seeing or going through. When their friends ask why they live with their grandma, they aren’t really sure what to say. But I tell them that they have a home that is filled with love and a grandma that has chosen to have them live with them because that’s just how life turned out to be. I’ve said this many times before, I may not be perfect (well ok, most days I think I am!!! ), but I do what I can and I do what I have to where help is needed. And when there are children involved, our hearts should all be willing to give. As I grow older and wiser as time goes by, I’ve realized that what I’m doing is one of the most important things in not just my life, but their lives. And though they have hurt and pain and so many unanswered questions, they are my life. And I would do it all again if I had to. The smile on their faces are priceless. You can’t take that away. That’s our tree. We got a real one this year. The house smells fabulous. And it couldn’t be any prettier. It was decorated with love and caring little hands. (We had some dogs that had to make their presence known too – that’s Coco). I’ve done my best this year to teach the kids the true meaning of Christmas. Yes, we all love waking up on that morning to see what’s been left under the tree for us. And sometimes that meaning falls short. But I want the kids to know why we set up our tree. What each piece means. What the star means, what the candy cane represents, what the gifts that Jesus got mean. I want the kids to know and learn as much as they can each and every year. Enjoy your family/friends and the time you spend with them this year. This Christmas I pray for each and every family to have a home filled with love. A family that they can lean on. Someone to put a smile on their face. Opening a gift will give that joy for a moment, but the true joy is the meaning of life and family. If you don’t have that I pray you find people in your life that will be that for you. May many new memories be made for you and yours. May you have a blessed holiday and the beginning of a wonderful new year. Every year we are like most families that celebrate Easter, we color our eggs. I’m not one to be all fancy smancy with out eggs because the kids are the ones that make them for us all. If I were in charge of how it were to be done, there would be a huge fight! So I sit and watch and try to direct as much as possible on how to do this or how to do that. My only panic was when I looked over to see them both using their hands in the dye, or when Caleb had started to pour the dye over his eggs, which then was all over the table. Jodi and Sammie stopped over to have dinner with us (we had Pulled Pork Sammies) and dye an egg or two. I didn’t even get a picture of the handsome little guy for you all to see. It was a pretty hectic night here!!!!! Not with Sammie of course. But a lot going on at once! The Friday before Jodi and I had a conversation about the meaning of Good Friday. I like to have a conversation with the kids when holiday’s come up so that they know the meaning behind the day. I can’t say that I know the reason behind the coloring of the Easter eggs and the Easter bunny, but I can explain what Good Friday and Easter means to them. So far, they haven’t asked how it fits together. When that happens, I may need some good advise. Saturday came and went with a minimal mess made with the eggs. The Easter Bunny came and succeeded to please the kids. We went to church that morning with the kids all dressed nice. I even got a picture of them with their arms around each other (I won’t say what happened after the photo snapped!! I hope you all had the best Holiday with your family, friends and loved ones. May your days be blessed with Love, Joy, Happiness and Peace. I found this on Pinterest a while ago and knew I had to make this for Easter this year. I make candy bark for Christmas time, but when I saw this decorated with different kinds of Easter candy, I knew we would all love this. Another super easy one to make. The best part, besides tasting it, was making it and adding all of the fun candy that you find once a year at the store in the candy isle!! Lay out a large piece of parchment paper. You’ll use this to make the Easter Candy Bark on. Melt the chocolates in a microwave safe bowl and mix together. The candy may not look as though it’s melted, but once you stir, it blends together. It look less than a minute and a half for this to melt. Spread the chocolate on a piece of parchment paper on a cookie sheet (mine covered almost the entire pan). I put each color of the candy melts in separate bowls and melted those in the microwave as well for less than a minute. Mix each bowl (or if you just choose to make one color) together. Place little spoonfuls of each color onto the chocolate. Take a knife and run it through, making a fancy little design. Start to top the candy and cookies on top of the chocolate and push down lightly so that the candy sticks once put in the fridge to set. After you have all the candy and cookies on that you want, place in the fridge for at least 3 hours or more. Once chocolate is set, take out and break into pieces and just eat!!!!! Simple, kid friendly, and great tasting Easter candy treat. I think the Easter Bunny will like this as well. I found this recipe while looking for something new to make for the holidays. I’ve only worked with egg whites once or twice before and wasn’t very successful. I like a challenge now and then so I thought I’d give these a shot. I felt a little like a mad scientist: sugar brewing over here, gelatin over there, egg whites in the mixer. I had a good time making these, maybe because I felt like I won- I beat the egg whites! It was so neat to see it grow in volume as it whipped together. When it was all done I was (overly) proud of my marshmallows. They are light and fluffy, with just enough (not too much) peppermint flavor. I think it would be fun to experiment with different flavor extracts and see how they taste. I shared them with anyone who’d try one, and even got a couple requests for the recipe! Coat a 13X9 pan with cooking spray; line bottom with parchment paper. Coat the parchment with cooking spray, and set pan aside. Put sugar, corn syrup, and 3/4 cup water in a small saucepan. Cook over medium heat, stirring, until sugar is dissolved. Stop stirring; let mixture come to a boil. Raise heat to medium-high; cook until mixture registers 260 degrees on a candy thermometer. Meanwhile, sprinkle gelatin over 3/4 cup water in a heatproof bowl; let stand 5 minutes to soften. Set the bowl with the gelatin mixture over a pan of simmering water; whisk constantly until gelatin is dissolved. Remove from heat, and stir in extract; set aside. Beat egg whites in the bowl of an electric mixer fitted with the whisk attachment until stiff (but not dry) peaks form. Whisk gelatin mixture into sugar mixture; with mixer running, gradually add to egg whites. Mix on high speed until very thick, 12 to 15 minutes. Pour mixture into lined pan. Working quickly, drop dots of red food coloring across surface of marshmallow. 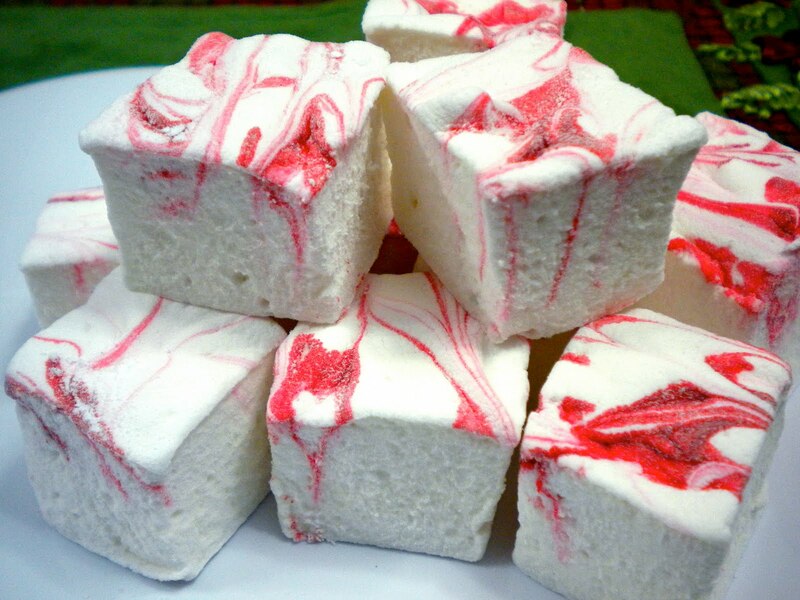 Using a toothpick, swirl food coloring into marshmallow to create a marbleized effect. Let marshmallow stand, uncovered, at room temperature until firm, at least 3 hours or overnight. Cut into squares. * The original recipe used an 8 in square pan. The marshmallows were very tall, I ended up cutting them in half. I prefer the 13X9 pan size. * These are quite sticky, but if you roll them in powdered sugar and brush off the excess they don’t stick anymore. I did this to the top and sides before starting to cut my second batch and they went much easier. * Using a pizza cutter to roll through went a lot faster and smoother than a knife. It’s been quite a while since my last post. I don’t want you to think this is due to a lack of baking though. In fact, I’ve been baking and cooking so much I haven’t had time to post it all! There was the Cheese Ball, the Peanut Butter Kiss cookies and the dipped pretzels. Those I do every year because they are favorites around here, my sister’s been asking for weeks for the kiss cookies. My mom loves these spritz cookies, so I always make a double batch. That’s a whole lot of spritz! I use the recipe that came with my cookie press, and they come out great every time. They’re like a little crisp sugar cookie. Preheat oven to 400° F. Thoroughly cream butter and sugar. Add egg, milk, vanilla and almond extract; beat well. Stir together flour and baking powder; gradually add to creamed mixture, mixing to make a smooth dough. Do not chill. Place dough into Cookie Press and press cookies onto ungreased cookie sheet. Bake for 6-8 minutes or until golden brown on bottom. Remove cookies from sheet and cool. I then frost them with a very simple icing and decorate: Mix 2 cups powdered sugar, 2 tbsp milk and 1/4 tsp almond extract until smooth. If too dry add a little milk, if too runny add a little powdered sugar. Each year I also use the holidays as an excuse to try out a bunch of new sweet treats too. Here’s a couple for you to try out. These are very thin crisp bars that have a light toffee flavor and a milk chocolate top. I was hoping the toffee flavor would be more obvious because I love toffee, but they are still tasty and very simple to make. Preheat oven to 350, grease a jelly roll pan. In a medium bowl, beat together butter and brown sugar. Add egg yolk and vanilla and beat until smooth. Beat in flour. Press mixture into pan and bake for 15 minutes. Immediately after removing pan from the oven place the chocolate on top and allow to melt. Spread the melted chocolate evenly over the surface with a spatula. These are easiest to cut while still warm. These were a new one, but have been such a hit they are gone already! I will be making another batch this week for sure. The recipe calls for a bag of caramels, but I felt ambitious and used homemade caramel from this recipe instead (told you I’ve been busy!). These are rich, so I cut them small before serving. Preheat oven to 350. In a large bowl, combine flour, oats, brown sugar, baking soda and salt. Stir in melted butter until thoroughly mixed. Press half the mixture into a 13X9 baking pan. Bake for 10 min, then sprinkle the chocolate chips on the baked crust. Microwave the caramels and milk on high for about 3 minutes or until caramels are melted, stirring every 30 seconds. Pour caramel mixture over chocolate chips. Sprinkle remaining half of oat mixture on caramel layer. 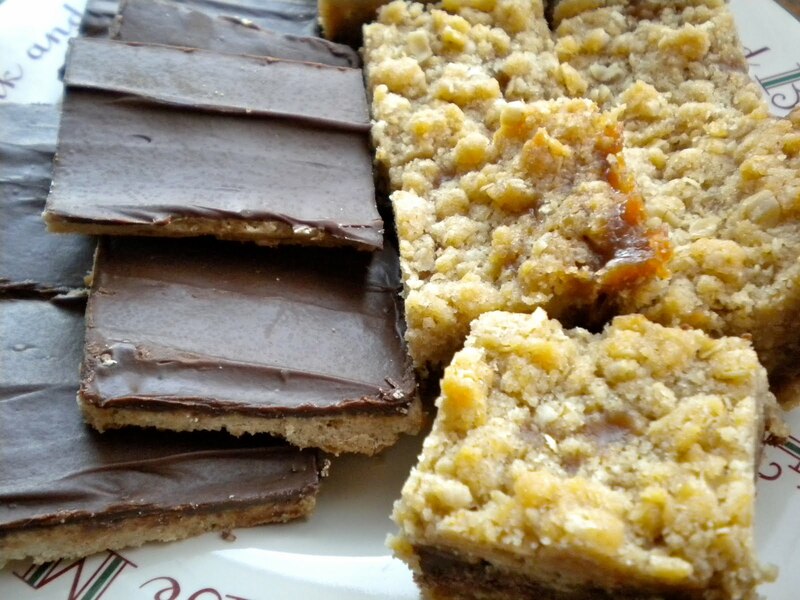 Bake for 20 minutes, cool completely and cut into bars. 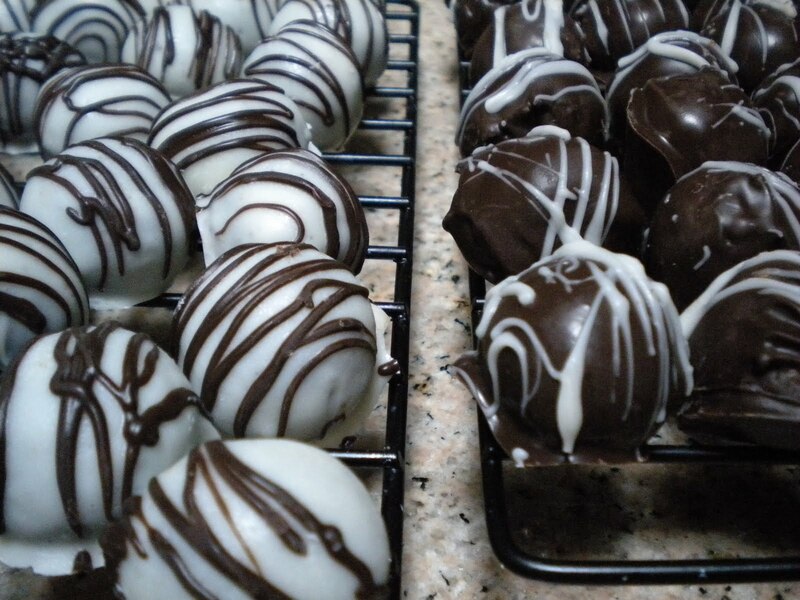 I think I’m almost done making holiday treats, and I’ll definitely share if I do make some more. One last thing I wanted to share was the holiday treat Scott cooked up for me this year. He surprised me with a trip to New York City last weekend. How exciting!! 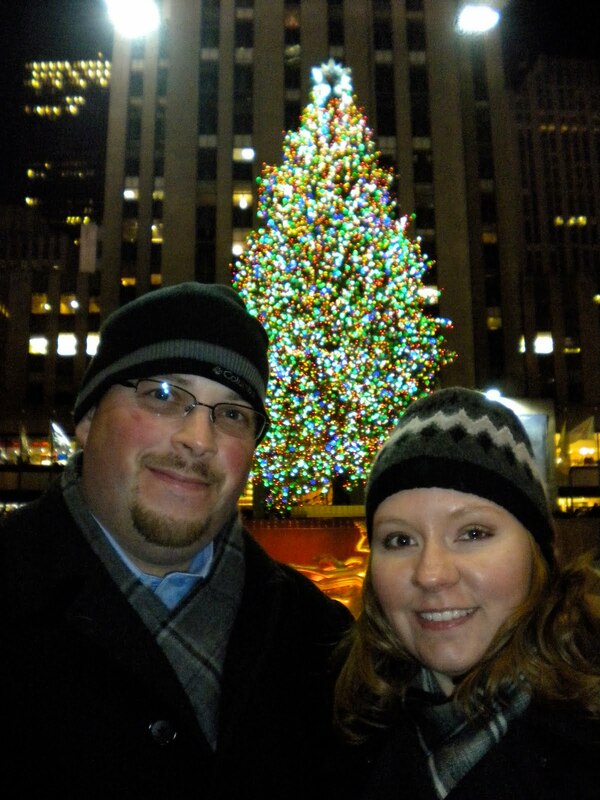 I’ve always wanted to see the city all lit up for the holidays, especially the big tree in Rockefeller Plaza. So we headed east with plans to see the tree and skate on the rink on Saturday night. We saw the tree (it was gorgeous!) and waited in the long line to skate, and I will admit I got a bit impatient… “let’s just skip this, we can come back tomorrow or something”. He was adamant, we were skating and doing it now. After a couple turns around the rink, I found out why. He led me to the center of the ice, got down on one knee and asked me to marry him! Oh wow! I, of course, said Yes!